Overall size (paper): 20" x 26"
Image size (paper): 16" x 23 1/2"
Canvas image size: 16" x 23 1/2"
The 127th Air Refueling Group is a unit of the Michigan Air National Guard, assigned to the 127th Wing, Selfridge Air National Guard Base, Michigan May 1999 � 30 September 2007. 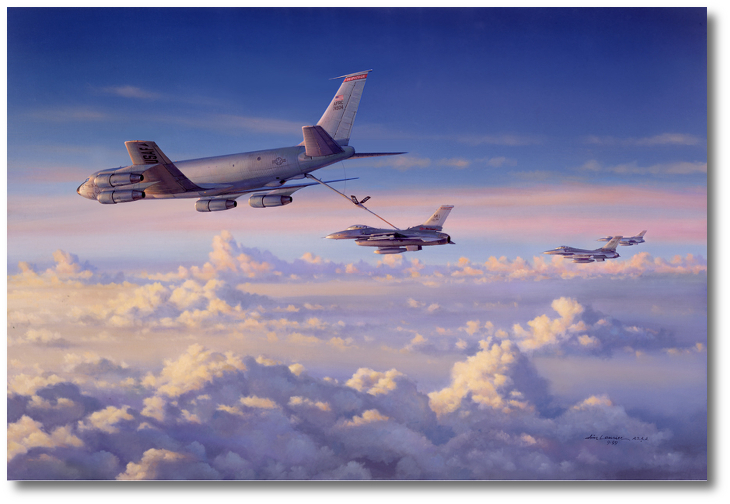 �Motown Magic� depicts F-16Cs fueling up behind a KC-135E Stratotanker of the 927th Air Refueling Wing somewhere over Michigan. The artist was on this mission on a beautiful evening as the sun was getting low, making for a fantastic sky scape above and below. The natural beauty, combined with the awesome spectacle of sleek F-16s flying in formation with the beautiful Boeing KC-135 made this aerial ballet seem like a magical scene from some fantasy.